Could something good actually come from last week’s incident in San Diego? There, a rain-soaked track led to lime, a dirt drying agent, getting splashed all over riders and bikes, leading to burned skin and damaged machines. That, certainly was not good. 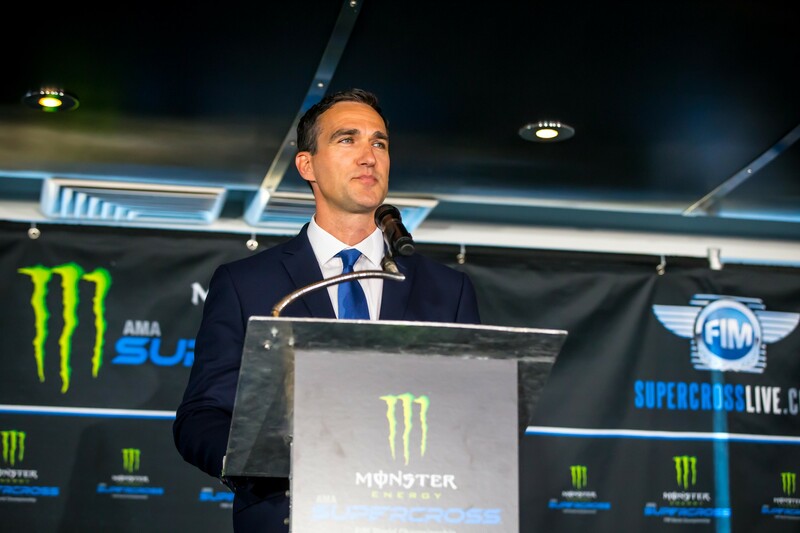 Feld Entertainment, the promotion group for Monster Energy AMA Supercross, has been on a communications binge since San Diego, first with the goal of personally calling every rider that competed in San Diego, including the parents of KTM Jr. Supercross Challenge participants. A public statement was remarkably frank. They’ve had conversations with the factory teams, and then a group of riders requested a meeting at the track in Minneapolis on Saturday morning. Further, Feld principals invited members of the media to a round table discussion to talk San Diego and more. This all leads to two points: first, we now have a clear understanding of the San Diego situation. But second, and this could be the positive part, all of this talking has made the entire industry aware that we all don’t talk to each other enough. Lines of communication opened to new levels this week, and Feld wants them to remain that way. “I actually thought it was a great conversation,” said vice president of operations Todd Jendro, of a Saturday morning meeting with the riders that many thought could get crazy. After all, a group of riders requesting a meeting with the promoters, with emotions boiling over from San Diego, creates a combination for chaos. However, contrary to rumors of things like lawyers and unions, the riders took a more measured approach. Simply talking was a major breakthrough. Transparency has been a theme for this last week, so to that end Feld explained to us that they have offered privateer racers that competed in San Diego $5,000 each. Some riders turned that down, perhaps looking for more. We had heard rumors that accepting the $5,000 also included signing a document restricting the right to sue. The truth is, those that accepted the $5,000 were asked to sign a piece of paper as a receipt, but we’ve seen a copy of the receipt, and it does not contain language releasing Feld from further damage, it only acknowledges that the rider had taken the money. This could perhaps still hurt a legal case, but the riders gathered for the Saturday morning meeting seemed adamant that they weren’t looking to pursue legal action. If communication is key to improvement, lawyers aren’t going to help that scenario. Plus, Feld needs to get some credit for trying at all. There were many jaded industry types that expected to hear nothing from the company last week, and certainly not an admission of an error, and most certainly not a public offering of cash to privateers. Perhaps, due to that, even the riders who have thus far chosen not to take the $5,000 still reacted in a civil manner. Feld doesn’t plan on upping the $5,000 figure, but riders that have turned it down currently can still collect it if they change their mind. What happened with the lime on the San Diego track anyway? Supercross has been using lime for over 20 years, and this is the first time anything this extreme has ever happened. “We go out and use it just like you would on a construction site or just like you would on a farm, it’s used every day to firm up soil,” said Prater. “So we pulled it [the plastic], we started putting the lime down about 2:45, roughly, and just as soon as we had it down on the start straight and that one bowl berm between the two whoop lanes, at 3:20 it [rain] just came down on us hard and fast. Our theory, which we think is a good one, but we’re still checking with more soil experts to make sure what we’re thinking is right, is all that water came down so hard and so fast, that the lime didn’t have the chance to activate with the moisture in the dirt, and a lot of it got washed into that huge mud puddle on the start, and that’s what led to it having a higher concentration of lime than it typically does. It didn’t really percolate down through the dirt at all. Most of the first part of the race it just sat there—you guys saw it, the guys took off and it was just splashing like a swimming pool. That’s how it all went down. 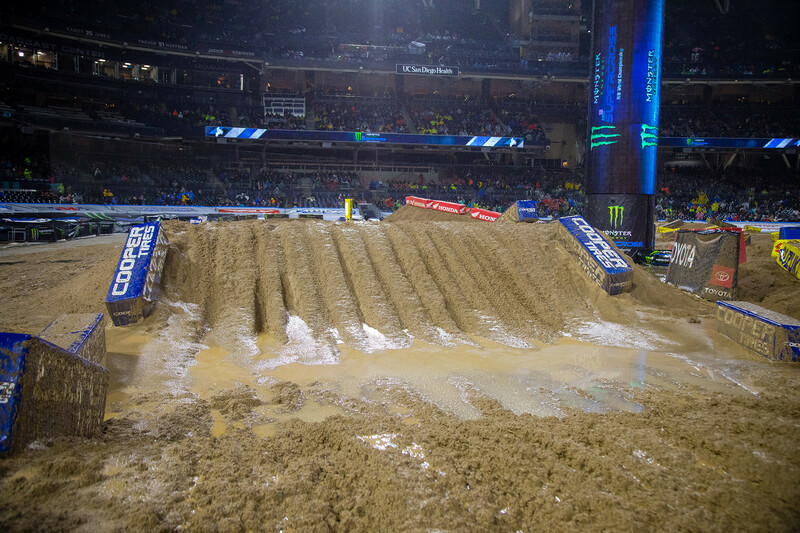 For now, lime will not be used in supercross tracks going forward. It was not used in Minneapolis. Feld will investigate other materials that could be used instead, or if they can change procedures to use it while preventing this incident from reoccurring. “We’ve looked over the years at alternative methods through the years and we’ve never found anything else is even close to as effective,” says Prater. Lime helps a supercross track build for two reasons: It makes dirt much easier to haul into a venue and shape into a race track, and second, firmed up soil produces fewer ruts. Reducing ruts on jump faces, is, of course, a safety priority. In the media session, Prater explained that lime is simply lime stone that is baked to a certain temperature, and then causes water to evaporate when dropped into moist soil. Feld believes there are no cumulative effects of lime—once it has dried out the soil, it returns to its original state as limestone (as far as Feld can tell, using the same dirt year after year for a race doesn’t create a more powerful reaction from lime. However, this week it plans more research with experts to make sure that’s the case). EPA officials visited Petco Park in San Diego a few days after the race and gave the building a clean bill of health. Prater and Jendro admit the race two weeks from now in Detroit, Michigan, will be a challenge if lime can’t be used. Lime has been thrown down on tracks in rainy conditions before without incident. The theory is that the San Diego rain was simply harder than most, and it hit at just the wrong time for the lime to soak into the soil. Prater said using lime as they did in San Diego is standard operating procedure—well, at least it was until now. The KTM Jr. Supercross Challenge, for riders aged seven and eight on 50cc motorcycles, also took place on Saturday night in San Diego. KTM asked parents to vote if the event should go on even in the mud, and the parents said yes. The little bikes only made it only three turns before the whole thing turned into a quagmire, and one rider did get burns similar to the pros. Prater and Feld’s Mike Muye spoke to all of the parents involved in the days after the event. Prater says in talking to the parents, the kids were more bummed they could only make three corners before getting stuck than anything else. Lots of conversations with lots of people this week. If any good comes this, it’s perhaps that bikes can be fixed and burns can heal, but the resultant conversations could create long lasting changes for the future. Privateers now realize a meeting is as simple as asking for one. Also, Saturday’s open media session in Minneapolis is the first I can remember in my 18 years in this industry. Jendro and Prater didn’t duck from any topics, and within 30 minutes we had clarity after an entire week of confusion. “We spent basically all of last week calling riders, talking to them, apologizing for the situation, and trying to figure out what we’re going to do moving forward,” said Prater. Sometimes talk is cheap, but sometimes it’s the bridge to something of great value. Supercross has been through this before. The 1995 Las Vegas Supercross was plagued by lighting troubles, and some riders chose to boycott the main event. Tensions between riders and promoters had reached a peak. This led to conversations, communication, and a much-improved product. It’s not a coincidence that supercross soon made huge strides in growth in attention and attendance, and riders started to make a lot more money. One rough night led to many great days ahead. 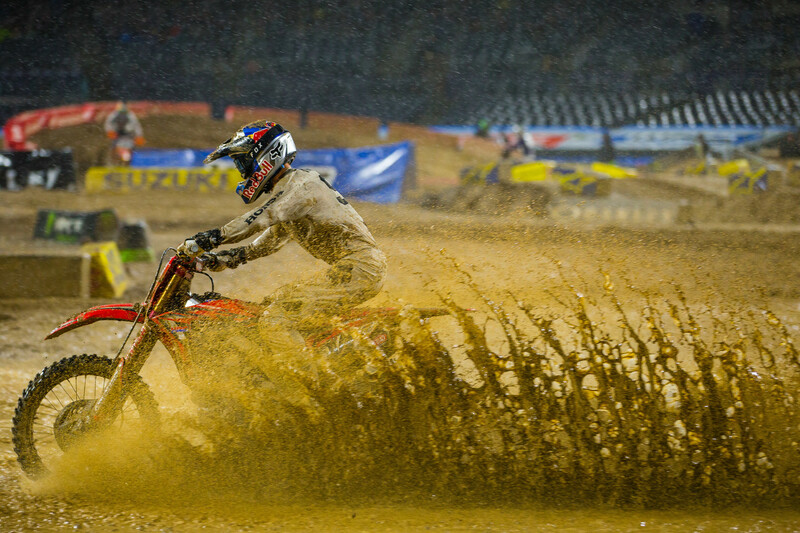 If this is all so, we might someday remember the 2019 San Diego Supercross for much more than lime on the track.